What is faithfulness? It is devotion, loyalty and perseverance. It means you are committed to Jesus; never backing down, never quitting, never giving up. That was Antipas – he was unshakably faithful to the Lord, holding fast to His name even in the face of death! 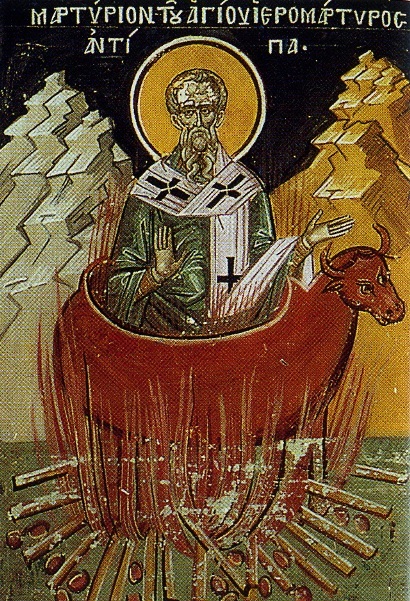 History says, idolaters in Pergamos enraged at Antipas, seized him, roasting him in a bull-shaped pot all because he would not deny Jesus. The principle of the Christian life is not denial or retreat, but endurance and conquest by faith. If we are to be witnesses for Christ, we cannot cower to the political correctness of our day; nor can we shrink back from our God-given responsibilities. Friends, we must, like Antipas, muster our faith, answer the call and if it cost us the ultimate sacrifice then so be it… Because, isn’t that what Jesus did for us? Amen!!! It can be hard some days, but if we keep our eye on the prize, never faltering, we will succeed in the end. It’s not easy but lessons like this one keep us going J. Thanks for always encouraging us and giving great examples!! !